1848 Cover to 'Barque "Reserve", West India Docks, London', per "Packet" showing very fine LUCEA/JU "5TH"/1848/JAMAICA CDS - DAY DATE IN MANUSCRIPT. 1825 Cover from St Vincent addressed to London showing on the reverse a very fine "ST. VINCENT/JUL 22/1825" FLEURON. 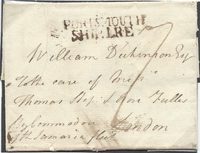 1776 ENTIRE FROM JAMAICA to LONDON showing a very fine two-line DOVER/SHIP LRE, Robs S1.